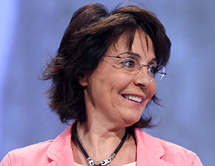 Commissioner for Maritime Affairs and Fisheries for the European Union, Greek politician and author, Maria Damanaki has initiated and enforced groundbreaking policies to end illegal fishing practices across the EU and around the globe. She has guided the creation of a new fisheries management model to transform the recovery of the bluefin tuna—a highly endangered and prized apex predator—through improved scientific data monitoring, boosting compliance, improving recovery plans, and enforcing tough decisions. She has also led ambitious efforts to reduce by-catch, promote sustainable fishing practices, and shape policies to encourage a vibrant ‘Blue Economy’ across the EU and Europe.